Indian Spices (Masala) are used in Indian food in various ways and in a way define Indian flavor and its cusine. Spices may be used ground or whole, fried or roasted, dry or as paste, at the end or in the beginning of the cooking, alone or with combination. Indian Spices always should add a subtle aroma and flavor to the food rather than assault to your senses. Thus, do not be afraid to use spices but use it in right amount. The style of cooking and thus, the use of spices depend on a particular region in India. However, the spices most often used spice through out the India are Turmeric, Cumin, Black Pepper, Mustard Seeds, Cardamom, Cloves, Fennel Seeds, Ginger, Garlic and Chilies. Indian spices can be mixed in specific amounts to make Spice Mixtures used in daily cooking. 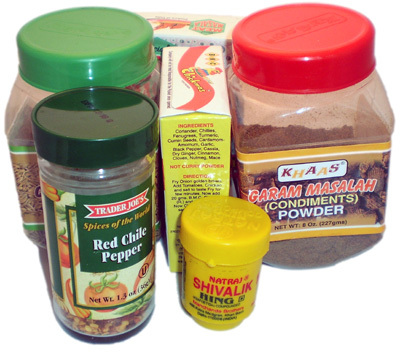 Some of the famous spice mixtures are Garam Masala , Chat Masala etc. The composition of the mixture might vary according to region but the basic ingredients remain same. Traditionally, women in the family used to make these spice mixtures themselves. However, nowadays already mixed spices are readily found in the market. Many of the formerly exotic Indian spices are becoming increasingly familiar to the western cook and can be easily found in any grocery store in the west. There might some difficulty finding the spice mixture such as Garam Masala though. If a particular spice is not available in the local grocery store, find it in a local Indian or South Asian store.